FTC Disclosure: If you make a purchase through a link on this page, we receive a small commission at no cost to you. We only recommend hotels we have used ourselves or researched thoroughly. San Francisco is certainly the most romantic city on the U.S. West Coast, and quite possibly the whole country. 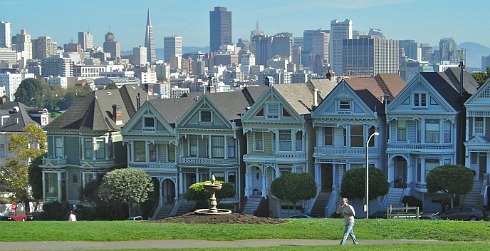 The Bay, the architecture, landscapes and atmosphere make "San Fran" a must for romantic travel. Even just a weekend in this Northern California city presents an tantalizing choice of romantic places to eat or have a coffee, cable car rides, wine tasting, excursions over water, or someplace high up to just sip a cocktail and marvel at everything you see. 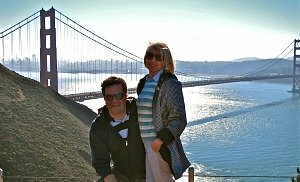 This is just a brief look at some of the best things for couples to do on a romantic getaway in San Francisco, including a couple of exciting day trips. 1. See Fisherman's Wharf: touristy for sure, but spend at least part of the day down here exploring Pier 39 and all the souvenir shops, street vendors and ice cream parlours. If you're staying downtown, getting here can be half the fun (see details of a romantic cable car ride to Fisherman's Wharf below). 2. Get to the Golden Gate Bridge: the most beautiful bridge in the world? Probably. And no romantic getaway in San Francisco is complete without seeing it at least once! Sometimes the Golden Gate can be totally shrouded in fog, which can add to the experience! Besides driving across it, you'll want to view it from a good vantage point. We think the best place to see the Golden Gate Bridge is from the Golden Gate National Recreation Area (look for the turn-off on Conzelman Rd ). About an hour before sunset is when it seems to look its best! 4. Tour Alcatraz: visit the most famous prison in the world! A short boat ride brings you out to this island-jail. Captivating place that can make you feel, well, maybe not quite "romantic" but...isolated (even though you're only minutes from downtown!) Self-guided tours are available and highly recommended. 5. Stroll Through Chinatown: make you way through the crowded streets of vegetable stands, fish and meat stalls, temples and restaurants. An exciting ethnic experience in one of the most vibrant neighborhoods in America. 6. Sail on a Romantic San Francisco Dinner Cruise: the only thing more romantic than a view of the Bay is to be boating in the Bay! Hornblower Cruises offers both Dinner Dance Cruises and a Champagne Brunch cruise. Looking for a romantic wedding idea on San Francisco Bay? Their elopement package is priced starting at $450 (2013 prices). 9. Explore More Great Streets: Filmore Street for local shops and eateries, the colourful Latino neighbourhood on Mission Street (between 16th and 24 St), and the shopper's paradise around Union Square. 12. 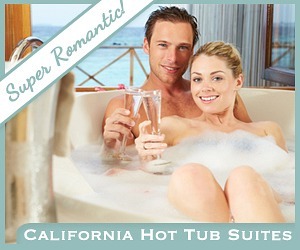 Celebrate a Romantic Anniversary in San Francisco: why not book a night or 2 in a romantic hotel? Better yet, make it a hotel in San Francisco with a private in-room hot tub suite. Romantic Getaway in San Francisco Packages - 2, 3, 4 & 7 night air and hotel getaway pacakges in San Francisco, including overnights in romantic hotels like the Hotel Monaco and the Marriott Fisherman's Wharf. 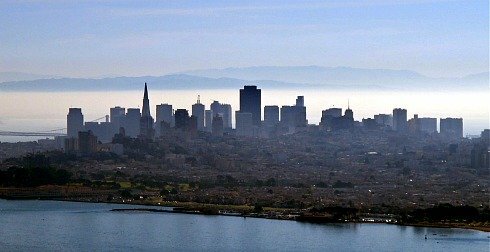 San Francisco's Romance Hotels on Sale - see deals and compare the best rates on some of the Bay area's favorite places to stay for romantic weekends! Suites at Fisherman's Wharf, The Donatello, and the Chancellor Hotel on Union Square. The Inn Above Tide - a great little romantic Sausalito B&B right on the waterfront with a spectacular view of San Francisco Bay. Golden Gate Park: even if you've only got a couple days for your romantic getaway in San Francisco, head down to this lovely place, one of the finest city parks anywhere. Over 1000 acres of rose gardens, lakes and green space framing the magnificent Golden Gate. And the Bridge is right there if you decide you'd like to walk or cycle across. Best Place to Watch the Sunset in San Francisco: Twin Peaks has fabulous 360 deg panoramic views of San Francisco and the Bay area. Another fine spot for romantic evenings in San Francisco is the sunset from Coit Tower on Telegraph Hill. North Beach - historic, a little bit gritty, but great views of the city can provide the romance you seek. Mid-mornings are a good time to explore this district of cafes, one-of-a-kind shops and Italian eateries. Crissy Field: part of Presidio National Park, great for walking along the waves and enjoying the views of the ocean, the boats, the Golden Gate Bridge, and Marin County. 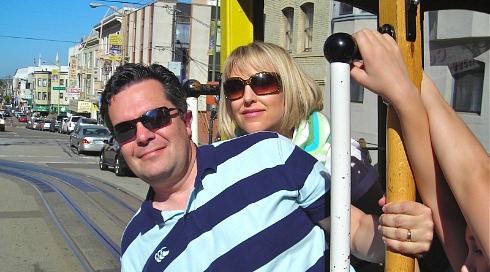 Don't miss the chance to hang on to the poles of one of the cities Cable cars as it clatters up and down the streets (this will put you right back into every Streets of San Francisco episode or Rice-a-Roni commercial you ever saw!). One of the best and most scenic rides on a San Francisco cable car is the Powell-Hyde Line which you can board downtown just below Union Square. You get a totally unique and awesome view of San Francisco, ride right past Lombard Street, and end up at the western edge of Fisherman's Wharf. 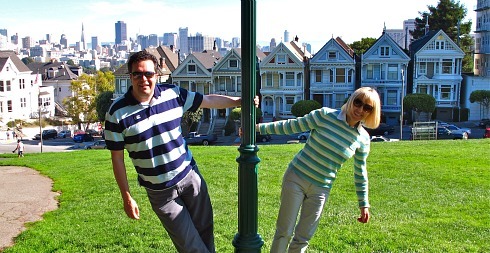 Sausalito: Just across the Golden Gate Bridge, you arrive in sunny Sausalito. It's a great afternoon getaway from the city, with nice views across the bay, a very walkable main street with just the right mix of shops, bistros, galleries and cafes. To get to Sausalito, you can get back on that beautiful bridge again on the --- north. Or, may we suggest an even more romantic excursion: the Golden Gate Ferry which chugs across the Bay in about 30 minutes. Napa Valley: A perfect day trip from the city, and a romantic destination all it's own. The Napa and Sonoma Valleys are full of excellent restaurants, spas, gorgeous scenery, and of course, some of the best wine in the world. Most international flights use San Francisco International (SFO). More and more low-fare carriers are using Oakland and San Jose. Getting around San Francisco presents the usual challenges common to any big US city. The BART system (Bay Area Rapid Transit) works well and connects SFO with downtown San Francisco and Oakland. FTC Disclosure: If you click and make a purchase through a link on this page, we receive a small commission. It costs you nothing, and doesn't influence our choice of content. We only recommend hotels we have used ourselves or researched thoroughly. Contact us to find out more. Philadelphia Hot Tub Suites - great 2019 rates on private in-room jetted tub suites in romantic Philadelphia PA hotels and inns. San Francisco Hot Tub Suites for 2019 - great rates on hotel rooms with private Whirlpool tubs in San Francisco, including Oakland, San Jose and Silicon Valley. Disclaimer: We have attempted to ensure this website is as accurate as possible. However, Excellent Romantic Vacations accepts no responsibility for any loss, injury or inconvenience sustained by anyone resulting from this information. You should verify important information regarding all travel documents, health and safety, customs, and transportation with the appropriate authorities and agents before you travel.